An 1860's found b&w framed tintype of an unknown Southern dentist (see pliers in his hands) is blown up, cut out, hand-colored with acrylics, photo dyes, markers, ink and gold pen. 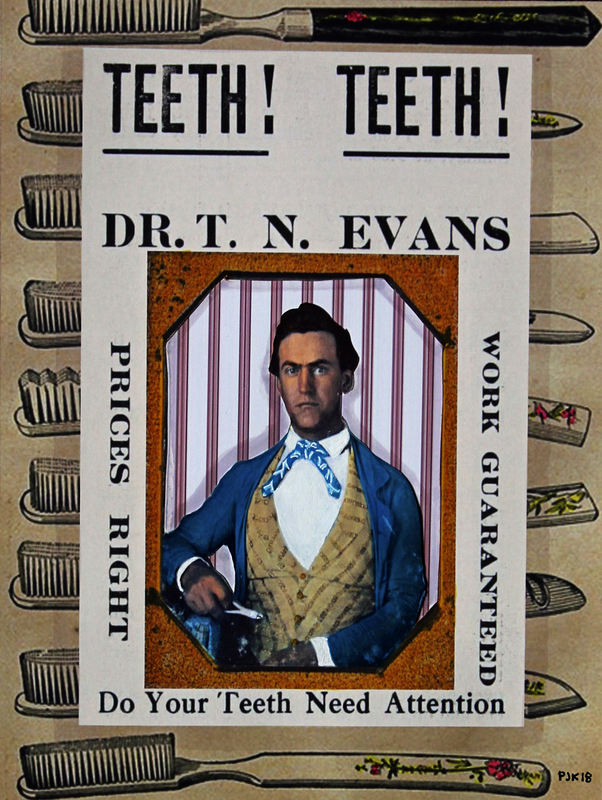 This is mounted on a late 1800's advertisement for "Dentistry Services: SCIENTIFIC!" which in turn is mounted on a Japanese toothbrush ad. The dentist named on the flyer is T.N. Evans, though the dentist in original tintype is unknown. Dr. T.N. Evans is located at 117 Bay Street in Jacksonville Florida. In fact, "he runs Jacksonville's most sanitary and up-to-date dental office. Consultation and examination free. Painless extracting free. We make plates to fit where others have failed.Teeth without plates or bridge work our specialty. Phone 1392." See alternate version of dentist mounted on a period encyclopedia plate about the mouth and teeth.